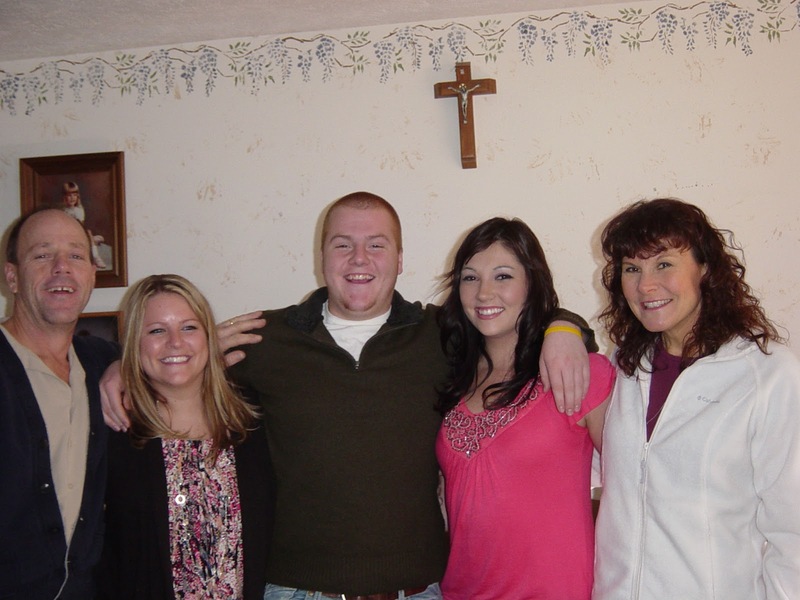 My daughter Angie, here in the white jacket, with her husband and children,needs your prayers. Please. She is one of the healthiest people normally....but yesterday she ended up in ER getting a brain scan and spinal tap. She developed a crippling headache and vomiting non-stop. She was sent to Indianapolis for more scans.....they found nothing wrong, in the scans or blood work.. She has no fever, but is home now with the headache. She has had migraines before, but nothing like this. We have called the family doctor and waiting for him to call back. I have been telling her to drink more liquids...as I think she is dehydrated at this time. Jewelry box and grooming set. I like the box having a torn out page in the bottom. Figurines, cups, saucers, and old linens...always someone collecting these. Hard to pass up. Hope all of you are safe and well today. Our friends in the south and heartland had a rough night. Deadly in places. Please , let's remember them in our thoughts and prayers. This is a cute box that I plan on hanging near the door. I got it at Horton's. This isn't the best photo of it, but it's so cute. I wanted something by the door to put mail that needs to go to the mailbox. This tiny wheelbarrow will look nice with some flowers in it. This is the rough paint color. I plan on changing that . It is just not what I want , but I saw what a cute bargain it was. Today is raining with a forecast of storms. Rain is predicted for the entire week here. The news of tornadoes and storms through the plains states is horrible today. Praying for those who lost loved ones or their homes. This is the greenhouse at Horton's. You can see they have the door open on a nice day, last week. There is just something about this old brick wall that appeals to me. The hanging baskets look so pretty in front of the wall. There's so many different flowers in them. 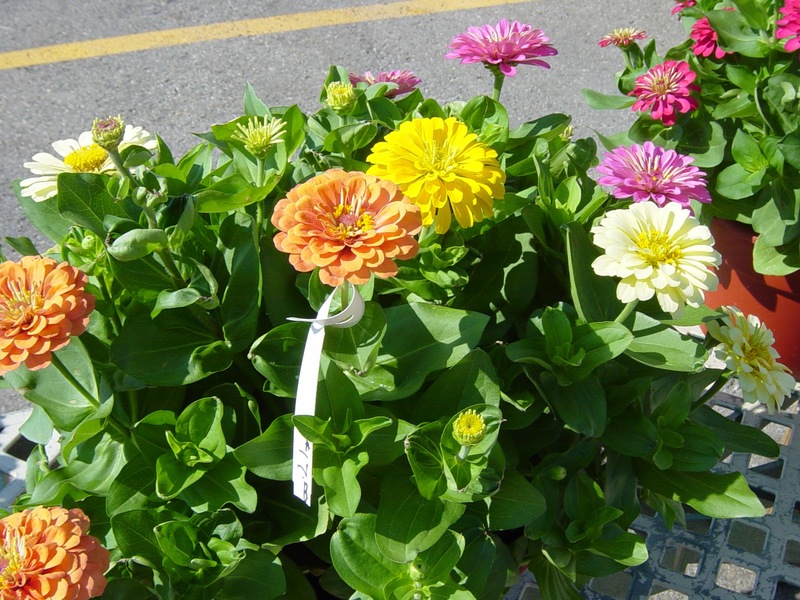 I liked this basket, but I didn't want to buy it till our temperatures warm up more. I think that's tomato plants on this table. You can smell the onion starts when you are in here. Hope all of you can be safe if you get the storms that is being forecasted for the next couple of days. Sorry about how I have these pictures loaded. I had a time getting this far today. Something is going on with the uploading of my photos the past two days. I really wanted you to see what is happening at Horton's in Tipton. The little pink chair in the first photo had a mate in the store , I got a shot of it also. I love to see the birds they use in their displays, as in the second photo. There's plenty of chippy architectural pieces , in corners, hanging on the walls, and used as shelves. In the 3rd. photo is a porch column, old frames, a mantle. a door or two. In the bottom photo is some new mercury glass votive candle holders. They are in an aqua color. Pretty with the inside of this little cabinet painted in the same color. This cute little house in town , on Main Street. 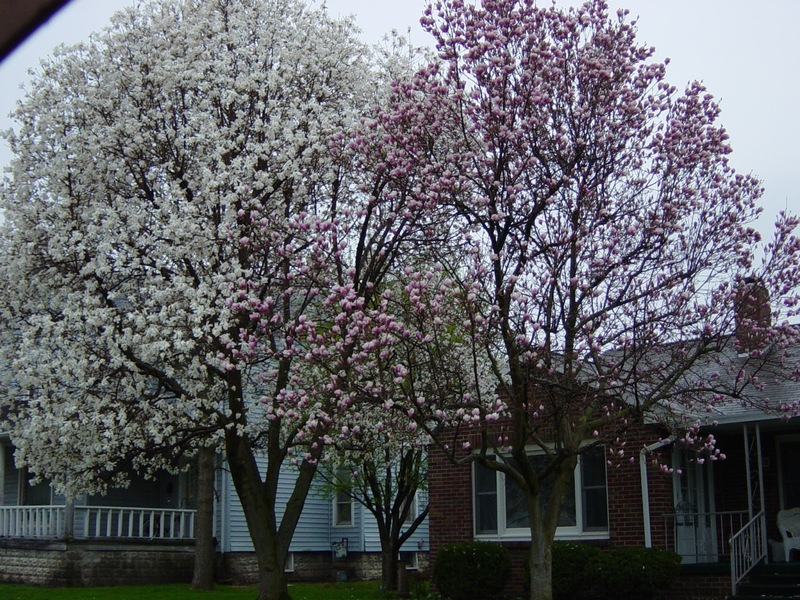 It has two of the prettiest trees right now. 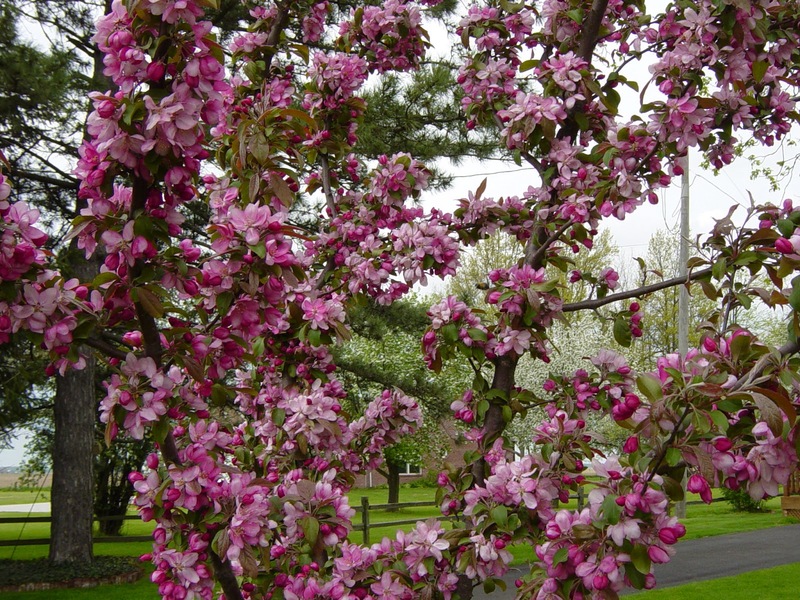 I am sure when they were planted , the one planting them never dreamed they would be so big. They actually touch each other. I am having problems loading my photos. I can get to the file, but once there, the lay-out looks different each time. I would love to see how well this all worked with a different carrier....know what I am saying. Slow service and flaky at best. That is how I would describe our carrier. A little water feature up near the porch. We have an alga killer in it, that is why it is foaming. The birds will be drinking out of it later. So it is safe for birds. A couple lilies in front of the stand. This area fills in with Black-eyed Susans, mums, and some sage. This is the garden area. Once it had veggies and strawberries. This year hopefully wildflowers. Because that is all I am planting in it . I will put a tomato plant in a barrel, near this. Yesterday never really felt too warm to me. But you can get warm, working in the yard. 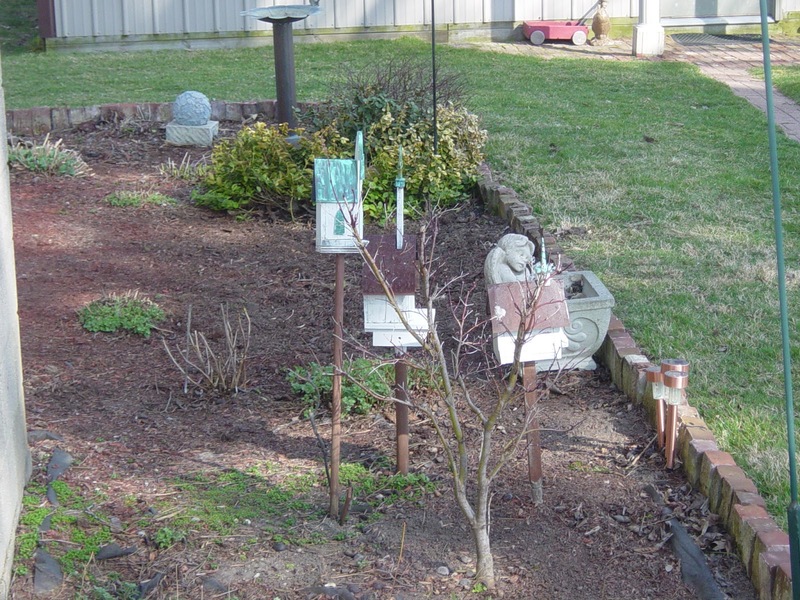 This is an old picture, of the front flower bed. But this is how it looks even now. The mums are stating to grow. Yesterday, we spent a big part of the day replacing bricks in the flower beds. Ted swept in more sand on the walkways. Looks much better. Today he will till up the little garden in back and I am going to plant wildflowers in it. I will be painting some things, if the wind isn't to strong. Savannah , in the lavender, is 12. This is her little party . I do not know all the girls, just Shamika, in the white and charity in the red. They are friends from her day care days. 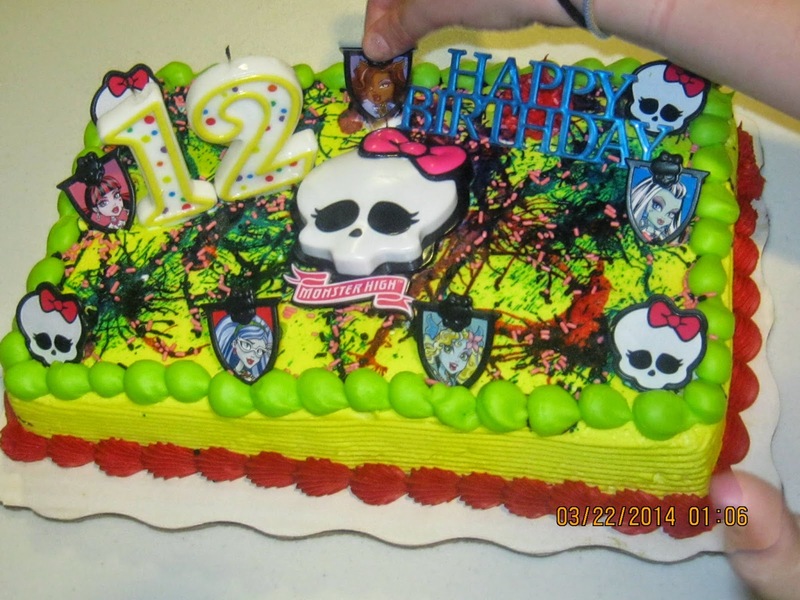 Gosh...I think this is Monster High Girl's cake. Looks way too creepy and sweet. LOL. But I know Savannah has all the dolls. I have a feeling she will be out growing them soon. Can't believe she is 12. Her birthday was last month. Just now found the pictures . Pansies and violas are what I bought to put into some containers. I like the burgundy and yellow. I did not want to get too many...you know, just in case it gets a bit cold at night. But the store had these outside. I bought a flat of this mix. Gave my daughter, Angie, a couple for a container on her porch. I bought a couple plants of something called Stock. I have never had this flower before. Always willing to try something new. It was a deep rose color. I think I am going to flower shop today. It seems to truly be Spring now. So I can't wait to plant some thing, anything . :):) Of course this isn't what is outside yet. This is from last Summer in town, at Jean's Plants. This is the St. Johns church that was in the background of yesterday's photo. The red house next door to it is the home of the priest. I love this old church. Very beautiful inside. Lightening struck the main tower a few years ago and burned, just the tower, so thankful it was not worse. 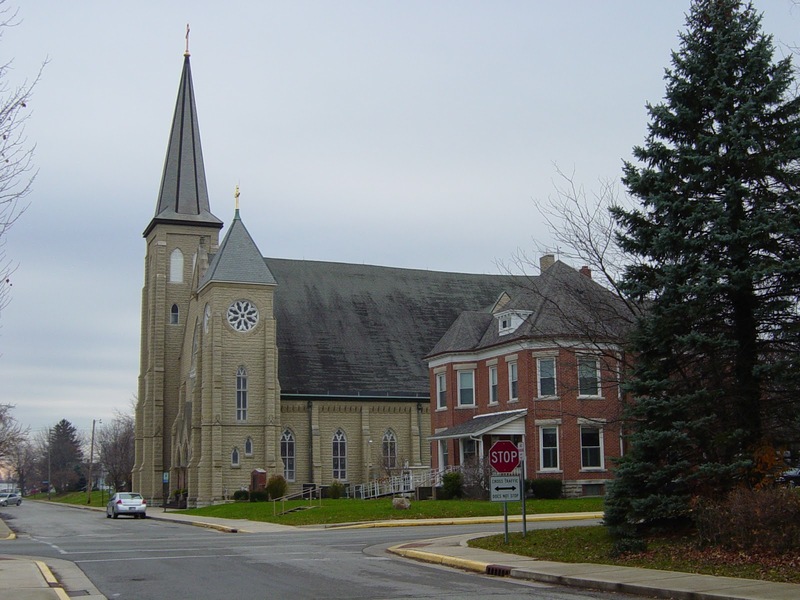 The St. John's school is to the east of this church. When I lived in town, I was only three blocks from here. So I could hear the school bells and the church bells. 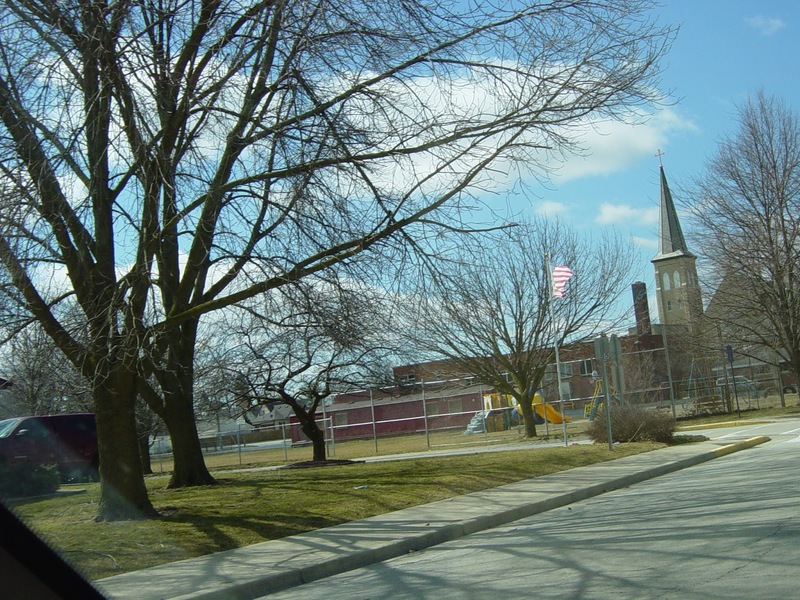 On calm days, you could hear the children at recess. 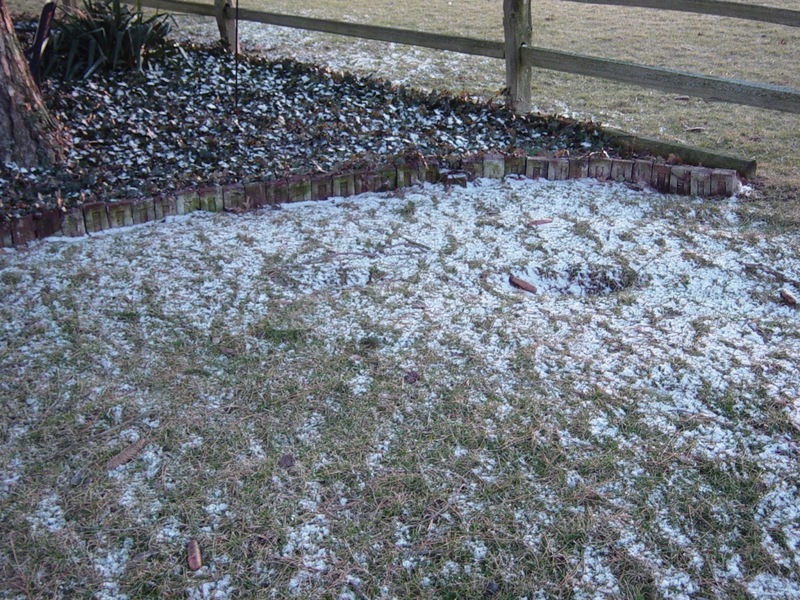 This is the ground yesterday morning, you all know what this nasty stuff is called....snow !! Now this is what I want to see in my yard. Not that white stuff. I want beautiful colors. 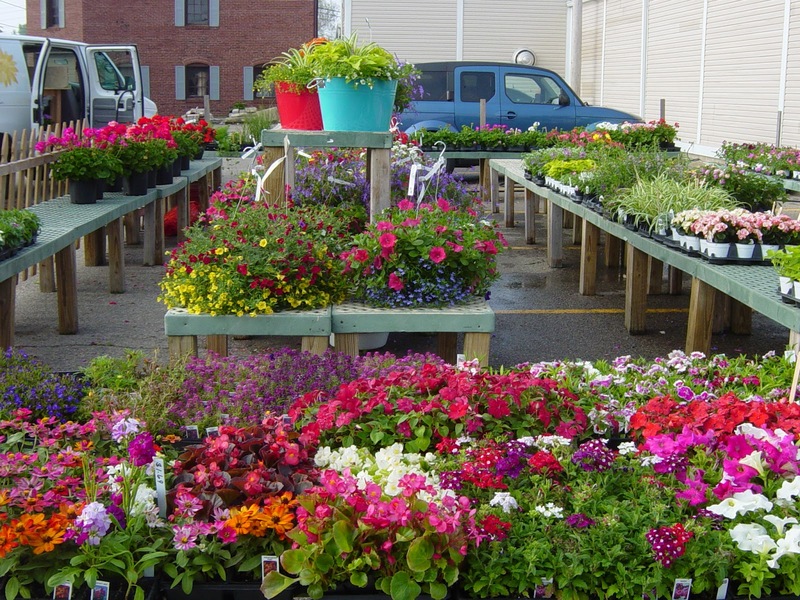 This is a photo from last year's flower sales , in town. 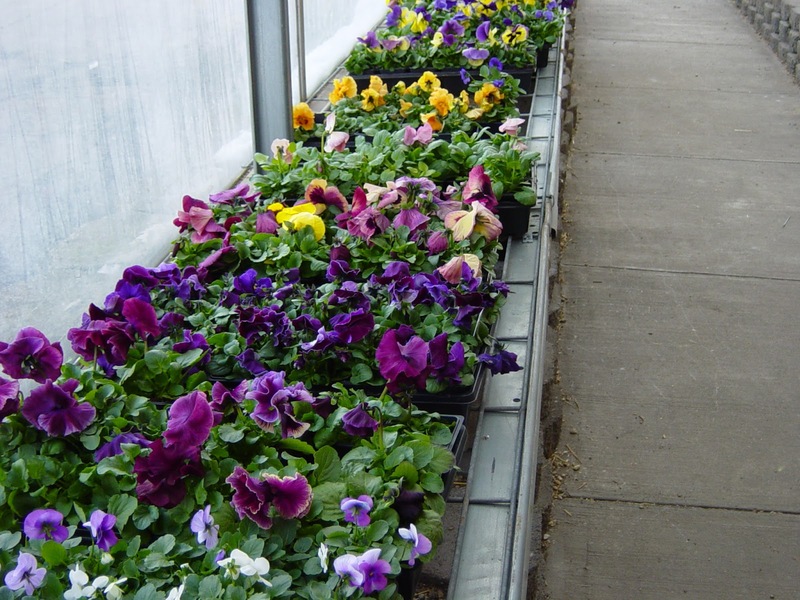 I almost bought some of these pansies and violas from Horton's last weekend. Oh boy am I glad I didn't. I think they are cold hardy, but yesterday, even I was not cold hardy. I felt cold all day. Didn't get warm till Ted made a fire in the fireplace after dinner. Here's a couple pictures of our park, from yesterday. The grass is greening, but the trees have not leafed out yet. They have trimmed the trees, cut down trees that were dying. Also they have planted many new trees near the creek that flows through our park. I absolutely will get more pictures as the Spring and Summer happens. We got a dusting of snow last night. My lilac bushes is leafing out. That seemed to have happened fast. I had just checked it two days earlier. I hope a cold snap for today and tomorrow doesn't hurt it. This is a bed of lilies growing. I can see I need to redo the trim bricks. Actually I have about three places that need attention. I don't think I will try working out in the yard today. Too windy and wet. While I was in town on Thursday, I went to the junk store. This is a pricy little whiskey bottle. The Lady said she'd work with me on prices. I just didn't think she'd come too far from the $50.00 price. I liked the foo dogs. One is clamed up and one is talking. :):) I did not even look for markings. Lots of old cooking pans. Cast iron skillets, a baking pan with fish shapes, an old toaster. Today is the Komen race for the cure. This is a photo of a labradoodle dyed hot pink, although it looks red. I took it from the TV screen. This dog's owner didn't make it to this year's race, so the lady's husband brought the dog. This is a photo of my daughter's Lizzy and Angie. 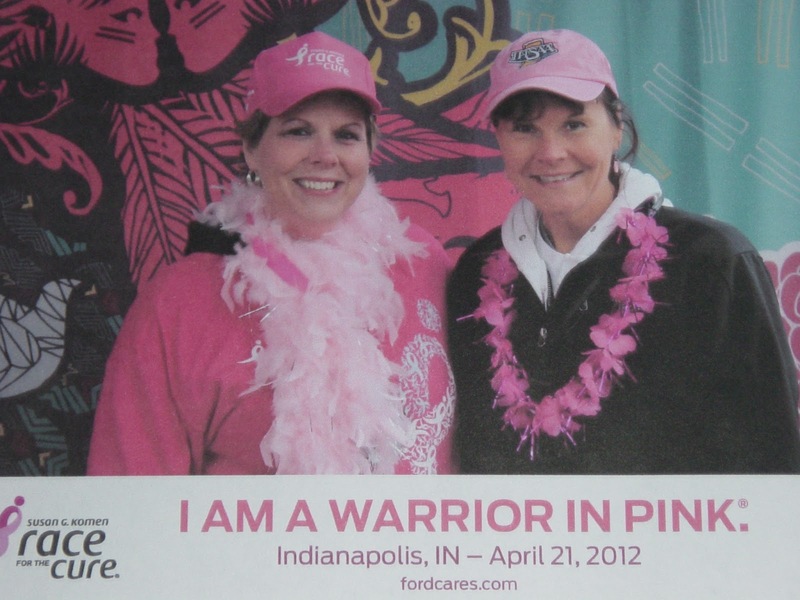 Lizzy is a breast cancer survivor. She is still free of the breast cancer. This photo is from 2012.....but the girls are there again today to race. They are to keep in touch and let me know how they are doing. Emma went to a dance on her birthday yesterday. It was a little dance at school.....I do not know why. She wore her dress from her sister's bridal shower. She told me then she would never wear that dress again, so funny. This is Brock, me, Lizzy, and Emma the birthday girl is in front. Emma is 10. She is my youngest grandchild. Still young enough to be goofy at times .LOL I can see the changes in her though. She is growing up. My sweet crafting pal. Oh by the way she had crafts planned for her sleep over birthday party. 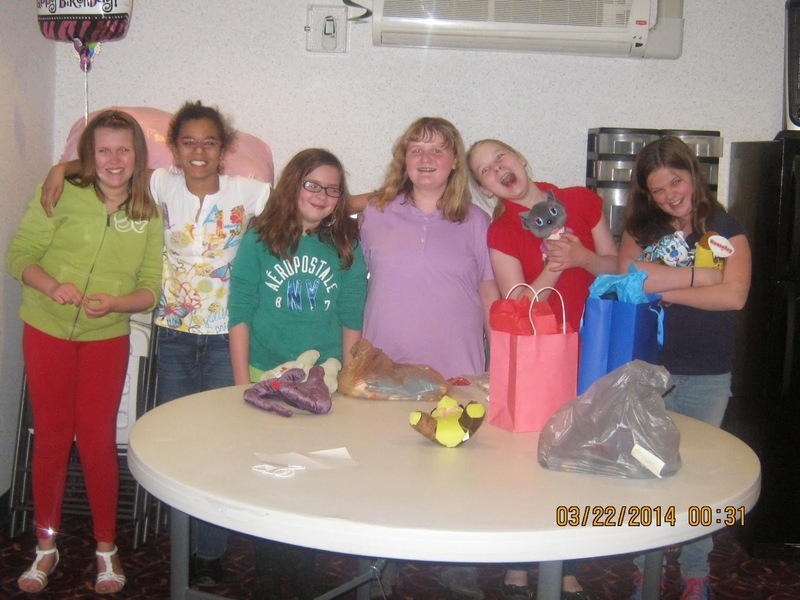 Emma and her little friends were going to make glow in the dark, night shirts. We had a great lunch at McAlisters deli. I had chicken salad on a croissant and apple sauce. Angie got the sweet grilled chicken on a roll with chips. We drank water. I usually always order water, because I don't need the soda and I don't trust the coffee to be good. LOL The fellow taking our order didn't seem to like that we ordered water, because he remarked "what with the waters? ".....what the heck.? After our lunch we went to T.J. Maxx. I can always find some cards or journals there. I love having nice stationary around. I write to my sisters a lot. They do not and will not have computers , so we write to each other. My youngest sister Barbie has a computer and really knows how to use them. Of course she had one on her job, I do think that makes a big difference. Today, Angie and I are going shopping and to lunch. This was last year's day out. We always have a great time and laughs galore. She's like me, we can do a few stores but not go all day and night shopping. Just get burned out looking at clothes. 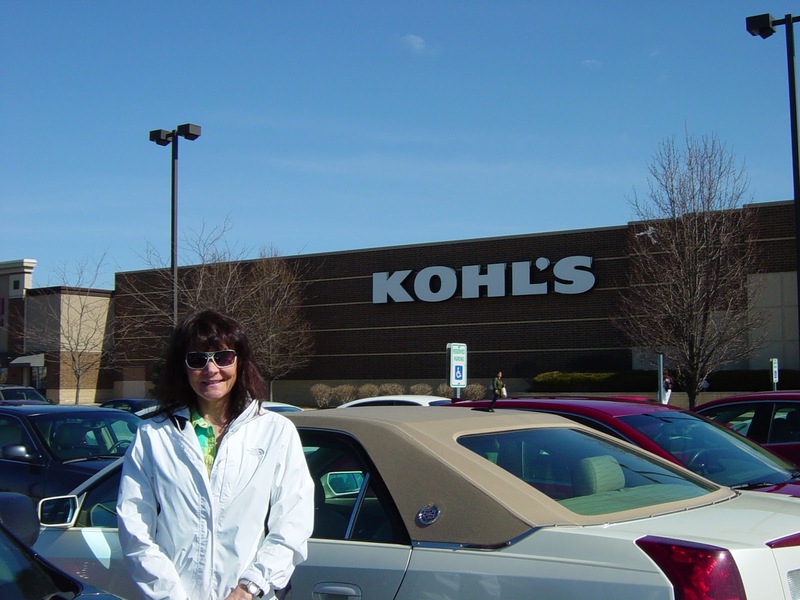 We always go to Kohl's because we have 20 and 30 percent off coupons. We eat at Bob Evans or Mc Allisters. Teddy Bear will have to get his own lunch today. He has signs to repair (Political). The heavy winds tore some of those signs down, so they are making them sturdier. 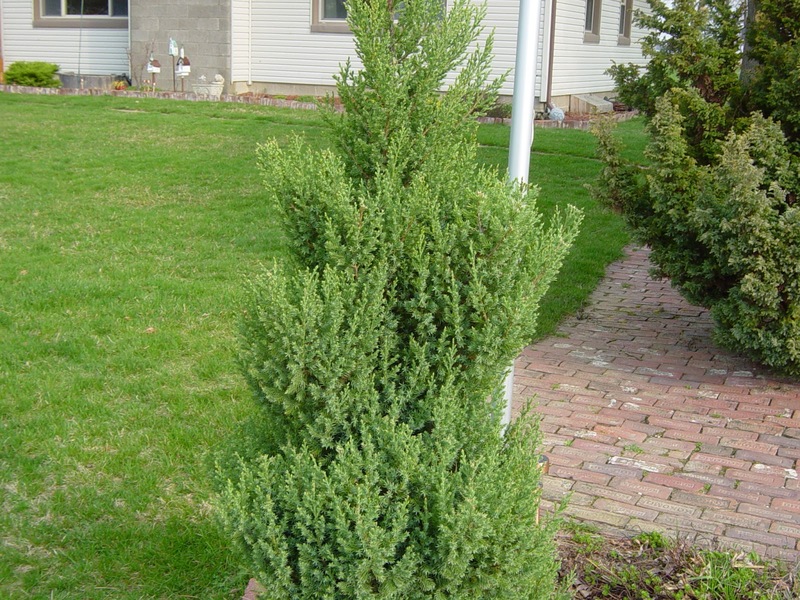 I will be trimming this juniper again. I just can't help it. I feel I know the right steps...I just think this juniper doesn't want to cooperate. This photo is from last year's before....and it is looking shabby again. So I do my part and get another picture of it to post. You can see the fir tree behind, that took over the walkway, that is the one Ted cut down on Saturday. Oh getting out of bed was painful. After yesterday's marathon yard clean up, doing laundry , and squeegeeing the basement floor, I didn't really want to get out of bed. My arms feel 4feet long. LOL. It is a satisfying pain of sorts. I know now that all I have to do it get my flowers into their containers and some in the ground. The lawn is greening up nicely what with all the rain , and the sunshine this past weekend. Here's our trailer full of yard debris .. We never really got a chance to clean the yard since November. So there were plenty of branches, twigs, dried leaves. We cut the flowers back. I usually do that in late winter, but never got the chance. Ted decided to cut this fir tree down. He said he hates how big it got , at the corner of the garage. This is half way through his chopping. The inside was all brown and dead looking anyways. All through the yard you will see this little piles. Ted calls them little beaver dams. This is how I clean up the yard. Rake everything into to small manageable piles. It suppose to be a pretty day today...but oh it's taking it's sweet time. 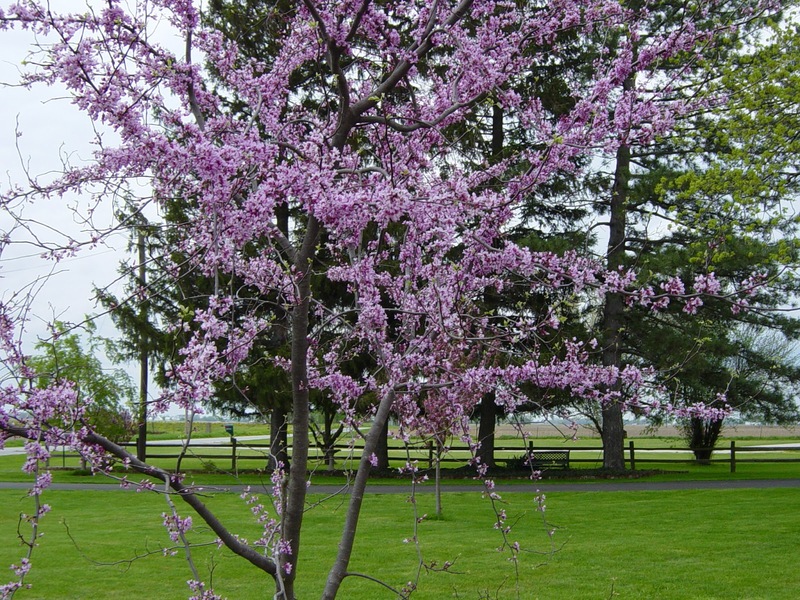 I am looking forward to our redbud and crabapple trees blooming and this lilac bush , that I got from my mother's old place. 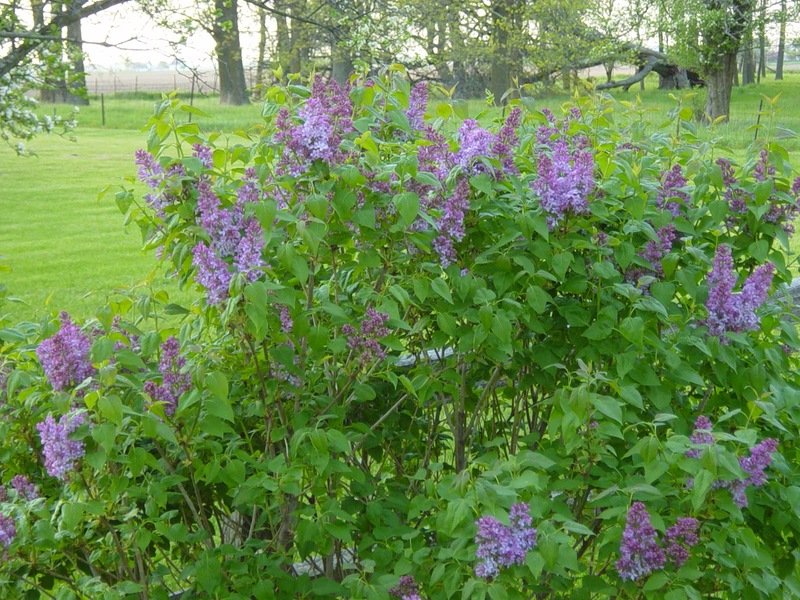 Remember last year was the first the lilacs had bloomed since I planted them. Day before yesterday , we had a small flash flood...but it was enough for me. The basement is dry and cleaned up . Now I am praying our weather will cooperate and start becoming nice enough to do some yard work. Oh it's not that I want to tackle everything at once. But absolutely need to clean out two or my flowerbeds. Starting to look sad around here. LOL.